You can become a "Licensed Parliamentarian." Click here. 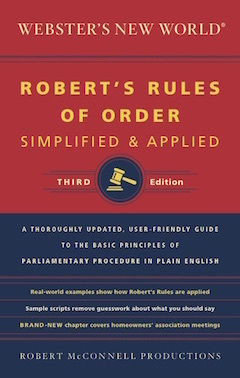 Robert McConnell Productions is proud to announce the publication of our book, the Third Edition of "Robert's Rules of Order: Simplified & Applied.” Since 1998 when the First Edition was published, it has been one of the most popular books on Robert's Rules of Order sold worldwide. The Third Edition has incorporated the most dramatic changes from the Second Edition (published in 2001). One example is how long the ballots are supposed to be held to be counted. And there are changes in disciplinary proceedings. Also new to the Third Edition is a discussion of what is custom and how does it affect an organization. The book also addresses "guidelines" which are so commonly used in organizations today. What distinguishes this book from others about Robert's Rules of Order is that it has an entire chapter devoted to Homeowner Associations (HOA's). It defines the rules and governing documents, members’ rights and responsibilities, proxies voting and the dos and don’ts of living in an association. It gives those serving on boards information about how to govern and conduct HOA meeting. The simplicity, clarity and usability of previous editions has not been changed. The reader will find the same helpful information about preparing agendas, making and debating motions, voting, serving on committees and boards. It has practical information about solving organizational people problems and scripts for presenting motions and conducting meetings. The book is available September 9th. The cost $11.95 plus $7 S & H. We are taking orders now. We will autograph the first 100 orders. So don't delay. Order your copy today. Video - 80 minutes PARLIAMENTARY PROCEDURE - THE VIDEO Parliamentary Procedures Made Simple. DVD includes description of secondary motions, incidental motions, and motions that bring back a question. (in English) 32 min Video tape, Audio cassette, agenda planning guide and generic meeting script. HOW TO CONDUCT A MEETING (in English) (32 min. VIDEO) World’s first video in English about “How to Conduct a Meeting” according to Robert’s Rules of Order. 20 minute DVD & CD combination. The DVD is original art with titles including a narration track. It plays like any other DVD. Video - 65 minutes Nominations & Elections (65 min, released Sept.2000) One of the most important procedures of an organization is how the members select their officers. "McMinutes: a Training Manual for Secretaries" by Robert McConnell Productions is a complete instructional package including 2 DVD's, a Workbook with Useful Appendices and a set of useful forms for taking the Minutes of a Meeting, and a CD with the appendices. … and you can buy it by clicking here. Thanks for checking in with us and if you have any questions for me e-mail me at LittleBen@parli.com. 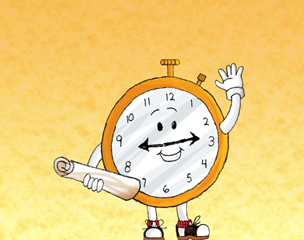 “Little Ben says” is a series of articles where Little Ben gives short explanations of topics in Parliamentary Procedure. Click here to see these articles. “Was it incorrect in assuming that the president quit, after stating she would quit, then stating she quit, and then telling the employee she resigned? Did she need notice of the emergency meeting? Is that emergency meeting void? It is our understanding that she will come to the next board meeting. We don’t’ know what will happen. In further e-mails I have received minutes of the two board meetings, November 18th, 2010 and November 23, 2010, and copy of the bylaws. I have been told by you that you have a seven member board. Two members resigned at the October meeting and two members resigned at the November 18th meeting. Organization XYZ received one written resignation from the board member who resigned at the November 18thmeeting, but the board has not received a written resignation from the president who declared “I quit” and left the meeting. Currently there are three board members. At the November 23rd meeting, two new board members were appointed to begin serving December 15th, 2010. Other business was also conducted at that meeting. First Question: “Was it incorrect in assuming that the president quit, after stating she would quit, then stating she quit, and then telling the employee she resigned? Answer: No, it was not incorrect to assume that the president quit. When a board member stands up, says, “I quit”, leaves the meeting, tells others that she has quit, and has not contacted the board members to say she has changed her mind, it is logical to believe this member has resigned. According to the bylaws, it is the duty of the board to fill the vacancy as soon as possible. Second question: Did she need notice of the emergency meeting? Answer: Since her resignation was not accepted at the meeting when she walked out, she is technically still a member of the board until the resignation is adopted. When someone abandons his post of duty, the other members would naturally assume that she did not want to participate in the special meeting or be a member of the corporation. Because the rest of the board is operating on the premise that she did not want to be a member of the board, the rest of the board would not send her notice of the meeting. I am not an attorney so I don’t know whether or not this argument would stand up in court. As a parliamentarian, I could present a parliamentary opinion on both sides of the case. Third question: Is that emergency meeting void? Answer: This is where there is a problem. In your bylaws, under “4.09 Vacancies /Resignation,” it states that “any Director may resign, subject to the prohibition of Section 5226 of the California Nonprofit Corporation Law.” This law states the following: “Except upon notice to the Attorney General, no director may resign where the corporation would then be left without a duly elected director or directors in charge of its affairs.” It is my opinion that this could be interpreted in two ways. One way would be that you still have three board members so you can go forward with your business. The second way the law could be interpreted is: that since your bylaws state that a quorum is “a majority of the total number of Directors with at least one Director being a currently elected Officer”(4.07), the resignations are not acceptable because it leaves the board without a quorum and the ability to conduct business. To figure a quorum under your bylaws which state: “A majority of the totalnumber of Directors,” the majority it figured from the total slots on the board, not whether they are filled with people. The total number of the board is seven directors. A majority is four directors. Right now the board has only three directors and therefore does not have enough people in directors’ positions to have a quorum to conduct business. Before I give a solution, let’s look at a parliamentary principle concerning quorum. First, there must be a quorum to have a meeting. However, if an organization gets to a place where there is not enough members to fulfill the quorum requirement, the quorum requirement cannot stop the operation of that organization. In cases like this members can amend the bylaws to change the quorum number so that they can meet and conduct business. I am not recommended that you change your quorum, but I believe the principle applies to your situation. This is how it applies. Since you had two members resign in October and the vacancies were not filled, and two more resign in November, this left the corporation with three members and no quorum so that it could continue to carry out its duties and responsibilities. However, it is my parliamentary opinion those three members had a right to fill vacancies so that the corporation could continue to operate. At the November emergency meeting, the only business that could be done was to fill vacancies. Since the board did not allow the appointees to take the positions immediately, then the other business transacted is not valid because there was no quorum. Any motions adopted at the emergency meeting will have to be ratified at the next regular board meeting. At the next regular board meeting, if the former president arrives, challenges that you did not give her notice of the special meeting and she is threating you with a law suit or some other action, then allow her to stay. At that point, ratify the appointment of the two new board members and state that they will take their positions immediately. Then ratify the resignation of the member who sent in a formal written letter of resignation. Next take up the verbal resignation of the former president. If she wants to withdraw it, then you can vote on whether to allow her to withdraw it. If the members vote “yes,” then you now have a six member board. If the members vote “no” on withdrawing the motion, then the vice president will put the motion to accept her verbal resignation to a vote. If it is adopted, she will be asked to leave and the board goes forward. If the members allow her to stay, then the next step is to vote on her resignation as “president.” However, before you take any action, this question needs to be carefully considered: What course of action will bring unity to this corporation and allow it to go forward to accomplish its purpose? If this former president does not come to this meeting ,the board still needs to ratify all other business that was adopted at the emergency meeting. It is my opinion that all that could be done at the emergency meeting was to appoint people to fill the vacancies. Until you have a quorum of four board members no other business can be legally transacted. If the former president is no longer a member of the board, the board has only filled two of the vacancies. Because your bylaws give you "an opt-out" on filling vacancies, you need to ask yourself, which positions are these two new board members filling? Will it be the ones that resigned in October or the two that resigned in November? Usually it would be the positions of those that resigned in October. The reason that an organization designates which positions is because the terms many vary. The board will need to know when the board members’ positions will end. I realize that your bylaws allow these vacancies to continue until the next annual meeting. However, you can see what happens if you don’t fill them immediately and others resign. The board is left in a position where it can’t operate because there is no quorum. At the November 18th meeting, when the president refused to place the motion for discussion and vote, it was a dereliction of duty. The board members had a right according to their bylaws to consider the termination of an employee. (4.05) Robert’s Rules also states that a president must place before the assembly every legitimate motion for discussion and a vote. bring copy of the bylaws to all meetings. be required to thoroughly read the bylaws and know the provisions in the bylaws. get a copy of Webster’s New World Robert’s "Robert’s Rules of Order Simplified and Applied" Third Edition and become familiar with it. This will prevent the problems that this board is having in conducting business and managing the affairs of the corporation. that the board adopts a parliamentary authority. The book mention can be adopted as one. that the board members take basic training in parliamentary procedures. that the board uses the services of a registered or certified parliamentarian. Summary: It is my opinion that the board had a right to meet on November 23, 2010 to fill vacancies on the board to meet the bylaw requirements to have a seven member board and quorum. It is my opinion that no other business at that meeting was valid because there was not a quorum present to conduct other business. The business adopted at that meeting will have to be ratified at the next regular business meeting where a quorum is present. This opinion is based on emails, the bylaws, minutes, and general parliamentary law. There is nothing in Robert’s Rules of Order Newly Revised 10th edition or Robert’s Rules of Order Simplified and Applied Third Edition that specifically address a situation like this. The parliamentarian has had to rely on bylaws and apply general principles to parliamentary law to give this opinion. © Copyright 1995 - 2019. Robert McConnell Productions. All rights reserved. Website powered by Live Imagination.